Despite a public consultation in 2010 to which nearly 60,000 people responded and over two-thirds stated their opposition to culling, the Government’s response was “…we remain strongly minded to proceed with a policy of badger control as part of the package of measures to address bovine TB.“ (Bovine TB Eradication Programme for England Section 3.3, p.42, Para 99.). It also seems the Government may not have wanted the public to know the outcome of this consultation as it was only published after the Humane Society International (HSI) put in a request for it under the Freedom of Information Act. Strangely, we’ve been unable to locate Defra’s published summary of consultation responses on either their old or new website or on the National Archives; nor is the extent of public opposition actually mentioned explicitly in the Bovine TB Eradication Programme policy document. So we have made Defra’s report available here (but also see Notes below). b) implement two ‘pilot’ culls to test the ‘effectiveness’ and ‘humaneness’ of controlled shooting (i.e. shooting of free-ranging badgers at night) before rolling out the new badger control policy more widely. The 2011 consultation of key stakeholders resulted in some 65,000 responses, even more than the 2010 consultation, but only 45 responses received were reported to be “substantive“ and therefore included in Defra’s analysis of responses (Defra 2011, p.4, Para 4). Furthermore, unlike the earlier Defra report on the 2010 consultation, the report of the 2011 consultation is much more general with virtually no meaningful quantification of responses or information about the nature or sources of the ‘substantive responses’. So much for consultation and transparency. Meanwhile, over 30 eminent scientists highlighted their deep reservations about the design and implementation of pilot badger culls through a letter to the Observer in October 2012; and public opposition to the badger cull continues to grow steadily with over 210,000 signatures on a government e-petition to stop the cull at the time of writing. As you can see, it’s all very confusing. The public doesn’t want a badger cull. The weight of independent scientific opinion appears to be against it. The police in pilot cull areas are reported to be concerned about the security and policing implications of the cull. It seems some farmers are worried about the potential public backlash against them with threats of boycotts. 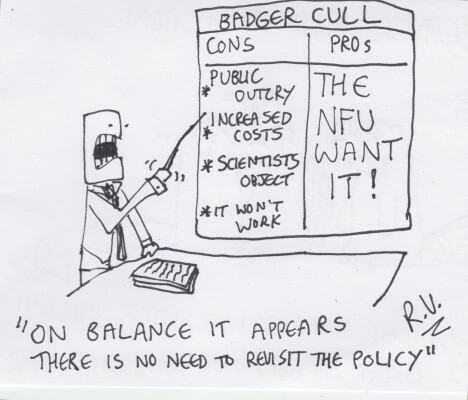 So what really is driving this deeply divisive and unpopular badger cull policy? We don’t claim to have the answers, but we intend to document the extent and nature of opposition to the badger cull policy, including the different grounds on which people are opposing it. 1. The Coalition Government’s views on the need for badger control are set out in Section 3.3 of its Bovine TB Eradication Programme for England (July 2011) and further detailed in its Policy on Bovine TB and badger control in England (December 2011). These are readily available through Defra’s website. However, we were unable to find a link to Defra’s report on Bovine Tuberculosis: The Government’s approach to tackling the disease and consultation on a badger control policy. Summary of Consultation Responses July 2011 on either Defra’s old or new websites or through the National Archives. 2. As the original Defra report says: “You may re-use this information (not including logos) free of charge in any format or medium, under the terms of the Open Government Licence…”, we have made the report available on Badgergate under the terms of the Open Government Licence for public sector information, which we have read as required.